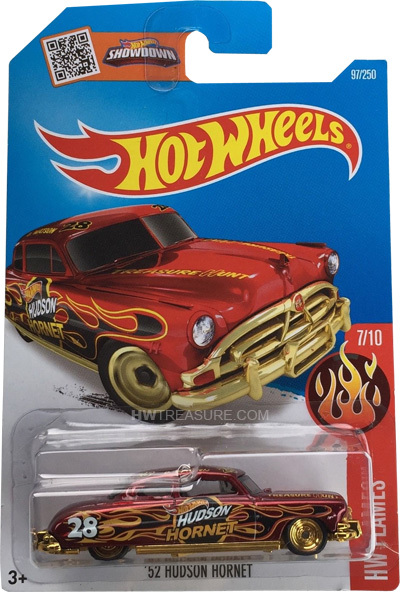 97/250 is part of the 2016 Super Treasure Hunt set and 7/10 in the HW Flames series. The Spectraflame red car boasts a variety of black, white, and gold graphics. 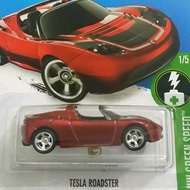 Each side of the hood has “Treasure Hunt” and the trunk features “TH”. The roof has “28” in each corner and “D. Watson” above the doors. The sides are covered in flames with the Hot Wheels logo and “Hudson Hornet” on the doors and “28” on the quarter panels. It has tinted windows, a black interior, gold chrome Real Rider Steelie wheels, and a gold plastic Malaysia base. 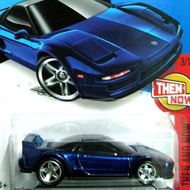 This vehicle can be found in mix “B” of 2016 Hot Wheels mainline cases. The Hornet made its debut in the Hot Wheels Boulevard series in 2012. It is based upon the highly collectible car that dominated NASCAR racing in the early 1950s.